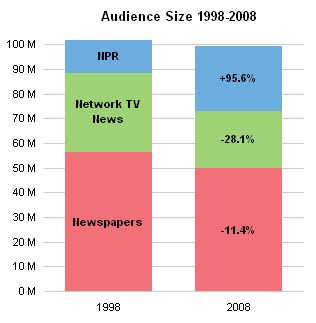 A reader asked if I had an add-in to create this kind of chart. He canceled his request a short time later when he realized that Excel can actually make these charts. 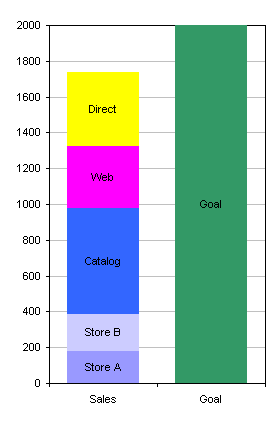 It’s a 3D column chart, and the reader pasted it from another graphing package. 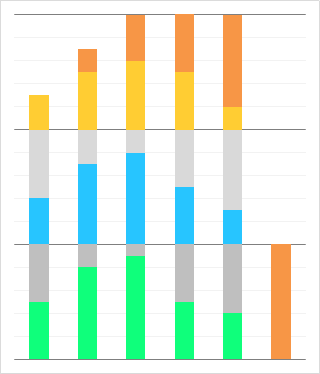 This is my reconstruction of the chart in Excel, which is somewhat cleaner than the original. 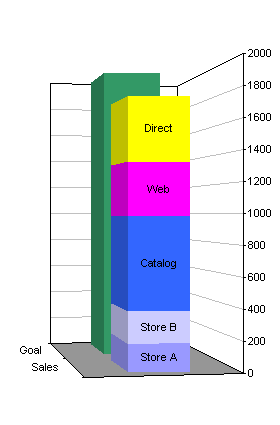 It clearly illustrates how 3D column charts make reading the data difficult to impossible. 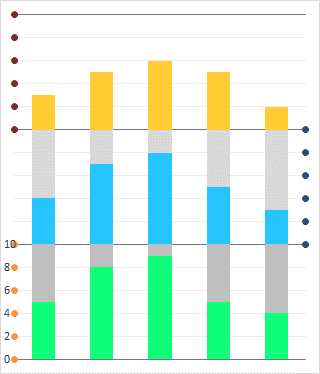 This chart is in some ways even worse than a regular Excel chart, because of the wider margins between the plotted columns and the back walls with the gridlines. I had to include extra rows and columns in the source data to simulate the wide gaps in the original chart. First, the columns in front block our view of those in back. The first two yellow columns are completely hidden, as is the first blue column. If you look very closely, you can just make out the top corner of the second blue column. Second, it’s hard to judge the values of the bars that are not hidden. For example, the tallest yellow bar has a value of 6, yet it seems to be shorter than the gridline for 4. The second green column has a value of 8, yet it barely reaches to the gridline for 4. The first green column has a value of 5, but only reaches to about 3 on the gridline scale. 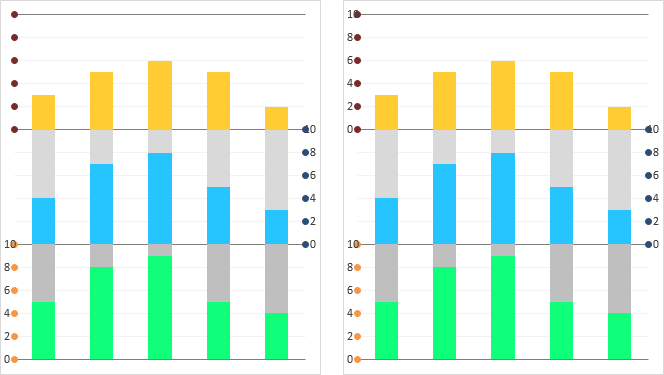 These discrepancies were less pronounced in the regular Excel 3D chart, because the back walls were closer to the plotted data, but it was still necessary to extrapolate to estimate the values. 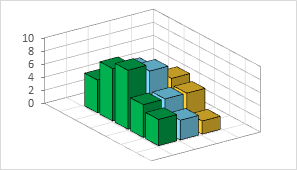 I have not developed, nor do I plan to develop, any add-in that makes 3D charts. Here is the data from the original 3D chart, based on my best extrapolation from the 3D columns to the gridlines, and made-up data for the columns I couldn’t see at all. The clustered column chart is the simplest way to show the data. If you haven’t changed Excel’s defaults, this is the chart type that Excel would automatically use. If you don’t have too many series, this shows the data clearly. No extrapolation is needed to a distant set of gridlines; at most you have to interpolate between gridlines. If there are lots of series, it becomes difficult to interpret individual series. You could also use a line chart. If you have more series, this might be more effective, because markers at small values stand out. 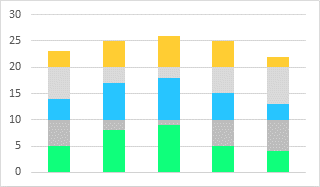 In a bar chart, shorter bars may be overshadowed by taller ones. Of course, some purists warn that line charts are evil for categorical axes, because the connecting lines may lead to inadvertent interpolation of values and trends between plotted points. Blah blah blah. If the categories are sorted into some kind of logical order (e.g., by date, by increasing or decreasing values, or by categories that fall into a natural sequence), and if markers are used to signify individual data points, this argument becomes pedantic. 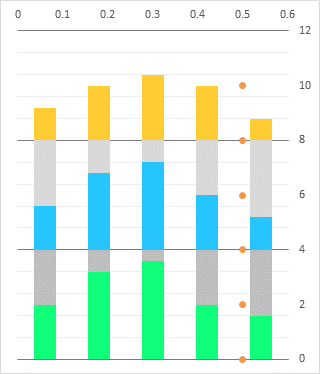 A third option is a panel chart, which separates each series into its own portion of the plot area of the chart. There is no longer any concern about too many series as there would be in a column chart, nor about interpolation between actual data points as in a line chart. 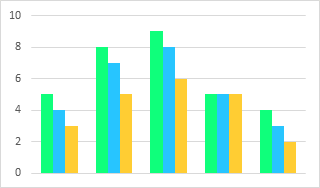 On the other hand, it’s not immediately obvious that the fourth bar of each series share the exact same value. Excel doesn’t have built-in panel charts like this, but they are not hard to make if you follow a simple protocol. 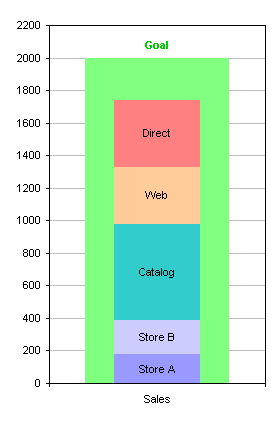 The panel chart shown above is basically a stacked column chart, with invisible columns between visible data. The built-in vertical axis labels are hidden, and dummy XY series provide the desired labels. The invisible columns make sure each set of columns is positioned in its own panel. Since each of our panels is 10 units high, the data plus the spacer must sum to 10, so our blank data is simply the difference between 10 and the preceding value. You need a blank series for each series of columns except the last. 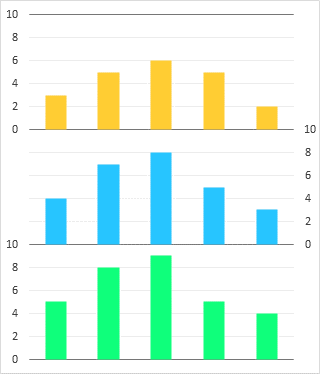 Starting from the clustered column chart shown above as the first alternative to a 3D chart, copy the data, select the chart, and use Paste Special to add the blank data to the chart. …or by changing the last argument in the SERIES formula in the formula bar. Now the “real” data is interspersed with the blank columns. Change the chart type to Stacked Column. 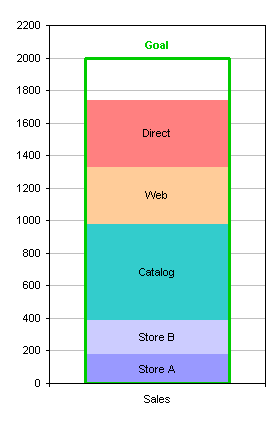 This could also have been done in the first step, by choosing Stacked Column in the Insert Chart dialog. Starting from scratch (often a better approach), intersperse the “real” data with the blank data in the worksheet (below), and create the same stacked column chart. That chart is a bit squat, so stretch it vertically. Change the scale of the vertical axis: make the minimum zero, the maximum 30, and the major unit 10, and make sure all of these are not automatic settings, so resizing the chart doesn’t mess everything up. Hide the vertical axis labels. Format the horizontal axis so it uses no line. Use a darker gray for the major horizontal gridlines, and insert light gray minor horizontal gridlines. Now we need some data for our dummy axes. The explanation below shows how we derived the values in the table below. 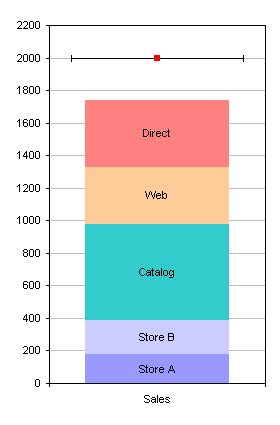 In a column chart, the categories are at X values equivalent to 1, 2, 3, etc. Each category uses the space from 1/2 category to the left to 1/2 category to the right of its equivalent X value, so the axis minimum is 1 minus 1/2 or 0.5, and the axis maximum is 5 plus 1/2, or 5.5. The X values of the dummy series will be 0.5 for the left-hand axis and 5.5 for the right-hand axis. Axis 1 (the first dummy axis) has labels to the left of the bottom panel showing 0, 2, 4, 6, 8, and 10 at the actual Y values of 0, 2, 4, 6, 8, and 10. Axis 2 has the same labels to the right of the second panel but at actual Y values of 10, 12, 14, 16, 18, and 20. Axis 3 has these labels to the left of the top panel at actual Y values of 20, 22, 24, 26, 28, and 30. These actual Y values are used to plot the dummy points that will show the desired labels. Copy the Axis 1 data, select the chart, and from the Home tab, choose Paste Special from the Paste button dropdown (left). Use the Paste Special options shown at right. The series is pasted as another column, stacked upon the rest. Right click on this new series, choose Change Series Chart Type, and select the XY Scatter type. Excel adds secondary X and Y axes for this new series. Format the XY series so it’s plotted on the primary axis. In Excel 2013 you can do this right from the Change Series Chart Type dialog. Select Axis 1 and add data labels. 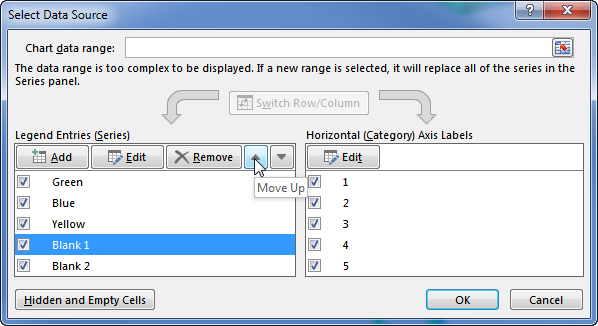 Use the Plus icon in Excel 2013, or use Chart Tools > Layout tab > Data Labels in Excel 2007-2010. Use the Left position and the Show Y Values display option. Don’t worry that the labels are smooshed on top of the data points; we’ll fix that shortly. Select Axis 2 and add data labels (left). In Excel 2013, use the Plus icon to add the labels, then choose the Value From Cells option, and select the range containing the Axis 1 Y values (0 through 10). 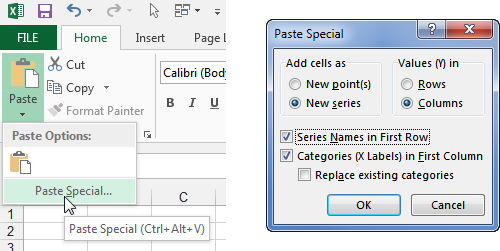 In Excel 2007-2010, add any old labels since there is no Value From Cells option, then manually edit the individual labels to display 0 through 10. Or you could use Rob Bovey’s (free) Chart Labeler add-in to assign data labels from worksheet cells. The labels for Axis 2 must be positioned to the right of the data points. Select Axis 3 and add data labels (right) using the same steps as for the Axis 2 labels, except that the Axis 3 labels must be positioned to the left of the data points. Now we just need to tidy up a bit. First, decrease the width of the Plot Area so there is more room for the data labels that label the vertical axes. Format Axis 1, Axis 2, and Axis 3 so they show no markers (left). Format Blank 1 and Blank 2 so they use no fill color (right). 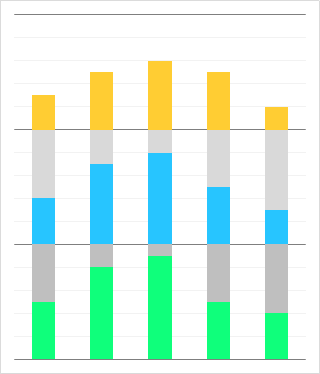 Lighter colored bars seem to hide the major horizontal gridlines that serve as horizontal axes for the panels. If you give the columns a border of any color and a transparency of 100%, the gridlines are somewhat more visible. If this isn’t good enough, you could muck around with horizontal error bars, or make the colored bars slightly shorter and the transparent spacing bars slightly taller, so the bottoms of the colored bars are slightly higher than the gridlines. You aren’t limited to separated stacked columns. 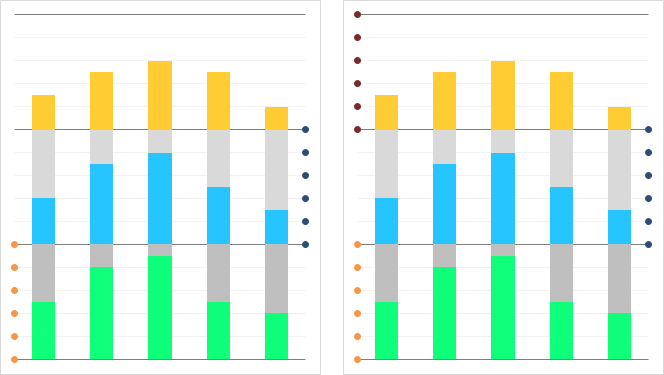 You could make the original stacked chart using either stacked area (left) or stacked line (right) chart type. 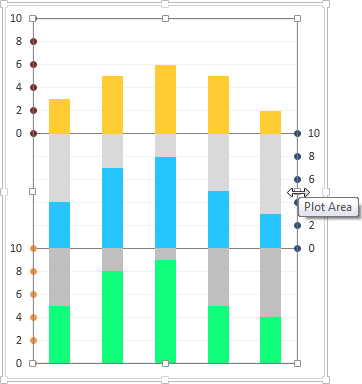 You don’t need to format the plotted series with different colors, because they are located in separate panels. You can avoid the pitfalls of color and simply use the same gray for all plotted data, and use text labels for identification. Posted: Thursday, September 12th, 2013 under Chart Types. 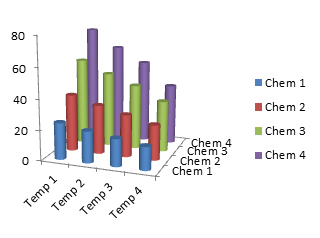 Tags: 3D charts, column chart, Line Chart, Panel Chart. 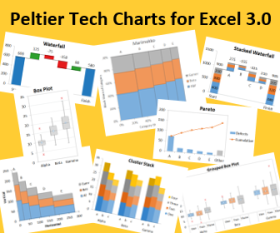 Excel offers a great many different chart types. Many of these are 3D types, which should be left off the palette of any serious data technician. Here is a simple cross-tab table of data, showing how the strength of an experimental alloy varies as a function of alloy chemical composition and test temperature. In a former life I was a metallurgist, and this data was going to change the world. 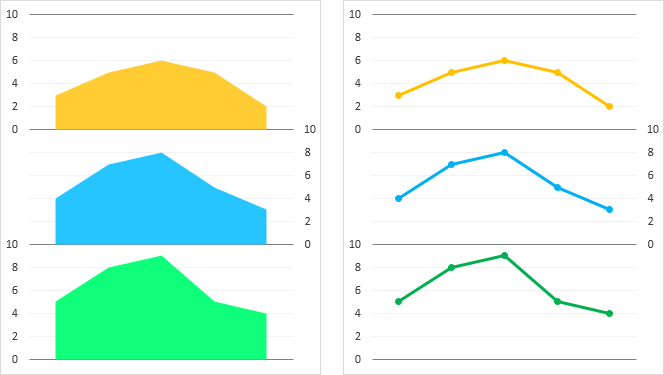 These 2D line charts are the clearest plots you’ll see of this data. Instead of confusing the viewer by trying to render a third dimension on 2D paper or monitor, the data is plotted as 2D data, with the third dimension represented by multiple series (one series for each factor level along the third dimension). Instead of trying to get everything into a single chart, the data is presented as two charts, one plotting the data by rows, the other by columns. The experts insist that line charts should only be used along axes that plot numerical variables, and not for categorical factors. That’s a little strict, and in this case, the Chem and Temp variables do change monotonically from low to high at nearly regular intervals. The much-maligned UI Ribbon introduced in Excel 2007 isn’t the worst ribbon in Excel. 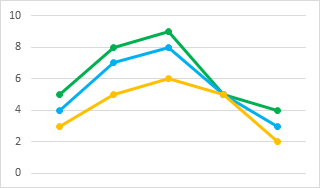 Among the most pointless 3D charts Excel offers is the 3D line chart, or “ribbon” chart, shown below in a handful of arrangements. The data regions of the charts are shrunk because of the need to put all the third dimension infrastructure in the chart. This loss of resolution is rendered moot by the distortion caused by the perspective view. It’s impossible to see where the “ribbons” lie with relation to the axes, or how they are positioned with respect to each other. And if the ribbons are aligned edge on to the viewer (see below right), they become nearly invisible. The data labels on the lines in the 2D charts above make identification of the series very easy. It’s much harder to get labels positioned nicely in these 3D charts (I know, I tried and gave up). We have to use a legend, and the chart above right shows one problem with legends: the series are arranged purple to blue from top to bottom, while the legend entries are arranged blue to purple from top to bottom. Our eyes forced to move side to side to relate data to label, and our brains are forced to think about this backwards correlation, leaving less cognitive power to actually analyze the data. 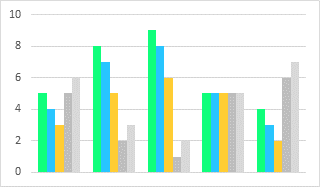 Differences in plotting order can make the charts even worse. 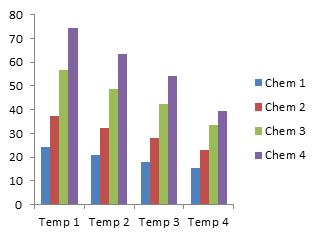 Left: strength for all temperatures is the same for chemistry factor 4; right: strength for all chemistries approaches the same value at the highest temperature. These conclusions are not borne out by the boring but accurate line charts above, nor by the tabulated data. In the first 3D area chart below, the Temp 1 data obscures all the rest. In the second, the data in back is exaggerated because the unseen but progressively higher baselines of each plank are hidden by the areas in front. 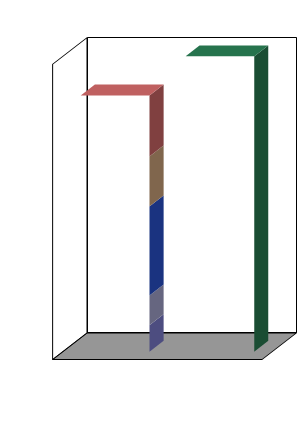 Blocking of rear data by front data occurs in 2D area charts as well, the the perspective and varying baseline is the third dimension’s contribution to this obstruction. 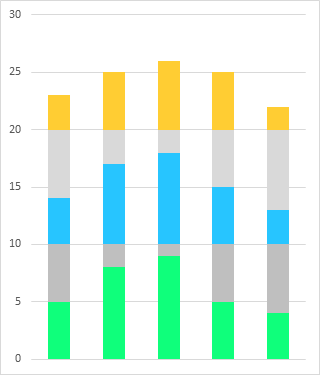 This 2D column chart isn’t a terrible way to show the data, though the taller bars make following the shorter series more difficult. This wasn’t a problem with the line charts. 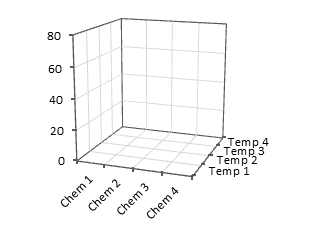 There are two ways to make a 3D column chart. Left: keep all of the 3D bars in a 1D arrangement, so it’s just a 2D chart with thickness, and the resulting distortion. Right: arrange the vertical bars in a 2D horizontal grid, so the perspective distortion is made worse by bars in front hiding bars in back. 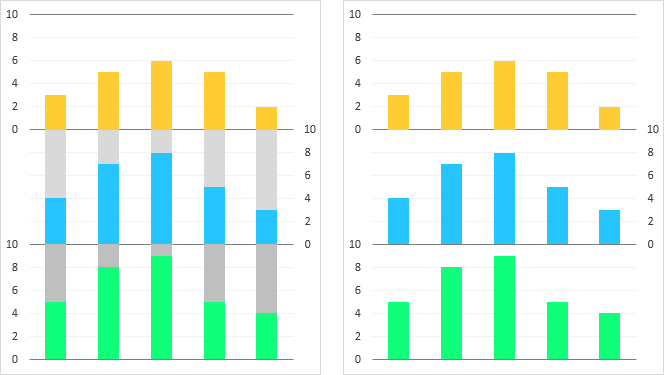 In the charts above the bars in front were only obscuring the baselines of the bars in back; in the charts below, which result from factors being shown in the opposite order, entire bars disappear in the matrix. Who needs rectangular columns when you can use cylindrical columns? Very pretty. You can further distort the data by using bottom-heavy cones and pyramids. You can also make truncated cone and pyramid charts, formed by starting with shapes of the same height, and cutting them off at the height representing their values. The heights are no easier to read than in the pointy charts above, but perhaps you can estimate the areas of the cross-sections to help judge the values. Hmm, except areas increase as values decreases, and values changes in proportion to the square root of the area (that is, proportional to the width of the area). If 2D Is Good, 3D Must Be Better, Right? All of the 3D charts shown above suffer from distortion. In the chart below, I’ve hidden the data, and made the borders of the walls visible, and added gridlines. No two lines anywhere in the chart are parallel. It’s very artistic, with lines extending to the vanishing point and all, but that only makes the data more difficult to judge. If you look at it long enough, the back corner suddenly changes, so it’s sticking out of the page. A chart showing your hard-earned data is no place for optical illusions. The way these charts have achieved their third dimension is not through addition of a useful dimension to the data. This third dimension is achieved by adding chart junk, coloring loads of non-data pixels, and greatly decreasing the data-to-ink ratio. So many of Excel charts can get very fancy, even without using gratuitous visual effects, such as shadows, gradients, glows, and transparencies. The 3D charts shown here are certainly fancier than the plain old 2D line charts at the top of the article, but not a single 3D chart shown here depicts the data as clearly as the line charts. Posted: Monday, September 12th, 2011 under Chart Types. Tags: 3D charts, Bad Charts. I like Wired magazine. It has interesting and insightful articles and a certain edgy attitude. I like the magazine enough to have bought a subscription for the dead trees version, even though you can find most of the print content online. There’s something about a real magazine or book that my laptop just can’t match. But the graphics department has some strange ideas about infographics. Wired generates lots of infographics, some very extensive. Sometimes they are pretty good, and you have to give them credit for trying some extreme things. But in The Dark Lord of Broadband Tries to Fix Comcast’s Image, a biting story about some sneaky packet filtering tricks the cable giant has been pulling, there were some relatively simple charts that raised my hackles. The article was a good read, by the way. When my family lived in Jersey, our cable was supplied by Comcast, and to be honest, I was satisfied with our service. Here in Massachusetts, our cable is supplied by the town, not by any of the cable companies, and I am even more satisfied. When I call for service, which is rare, the phone rings about three miles away, and the service guy is likely to come by within a couple hours. The town provides cable and electricity to its residents on a not-for-profit basis, too, so the price is also very satisfactory. The first chart was merely a list of the five worst companies (in a list of 60). To highlight the star of the article, the artist used a thick 3D bar, when a 2D rectangle would have been sufficient. But the 3D bar didn’t really detract from their point, so I can be talked into ignoring this transgression. 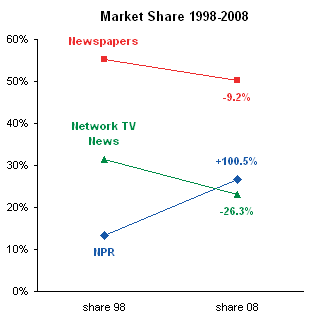 The other three charts in the article were less forgivable. 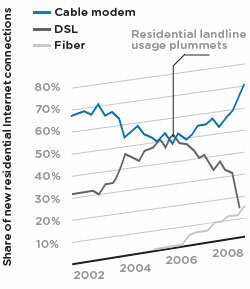 First was a line chart showing how the market shares of new cable, DSL, and fiber installations have changed over the past several years. A line chart is definitely the appropriate chart type for this data, but they gave it a 3D aspect. They didn’t give the lines a thickness, fortunately, so we aren’t forced to untangle a set of ribbons. But the inclination skews the perceived slopes of the lines. 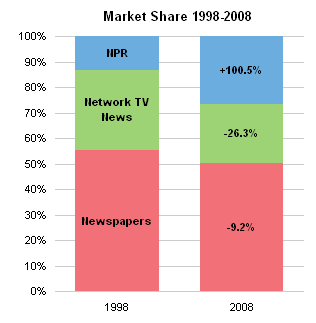 The next chart is a pie chart showing the market shares of the hookup types in the most recent year. 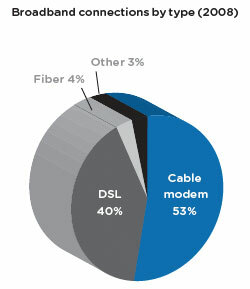 This is actually not a bad use for a pie chart: there is one very large segment of around 50% and another nearly as large, plus a couple small ones. I softened my stance against pie charts when I saw similar ones relating to the recent US elections on FiveThirtyEight.com. 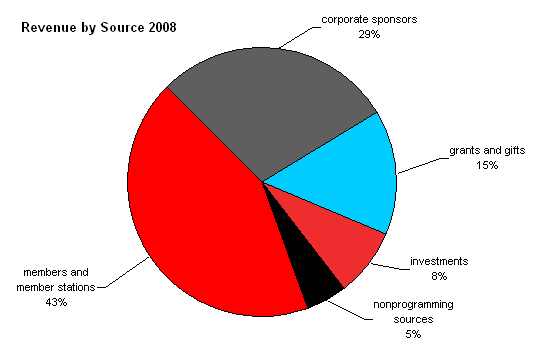 However, the depth of the Wired pie chart in the third dimension makes it more like a log chart than a pie chart. We see now the reason for the three dimensions of the line chart above: the three charts in the set all have matching 3D orientations. Skew one, screw them all. The final chart of this triad is a 3D column chart. The 3D effect isn’t too distracting, at first glance. 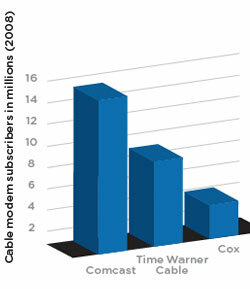 However, after looking more closely, it’s clear that the inclined baseline and the false depth make Cox appear to be at least half as tall as Time Warner, and Time Warner to be two-thirds as much as Comcast. The actual proportions are smaller than they appear. Usually I construct my own versions of the offending graphics. But this time I’ll leave it as an exercise for my readers. Posted: Wednesday, January 28th, 2009 under Charting Principles. Tags: 3D charts, Bad Charts, Wired magazine. I always tell people to avoid using charts with 3D effects, and they wonder why. 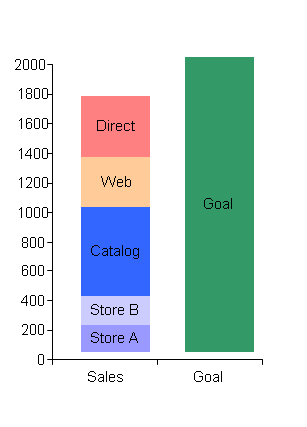 I’ll use an example from the Mr Excel forum to illustrate much that is wrong with 3D charts. The Mr Excel thread, Excel Chart – stacked column to chart progress, dealt with ways to show progress towards a goal, where the progress consists of a sum of items. One suggestion was to use a stacked column with 3D effects. Some sample data is shown below, along with my best reconstruction of the 3D chart offered as a solution. Never mind the aesthetics of the chart, let’s look at how ineffective it is at conveying values. 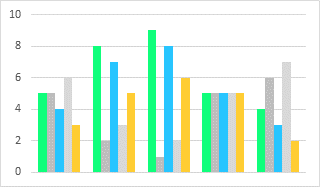 I can’t do better than guess the values of any of the bars, except perhaps the top of the dark blue one, which is just below 1000. I don’t know where to extrapolate the lines otherwise, and without printing it out and marking it up with a pencil and straightedge, I have no chance. Does the yellow bar stop midway between 1800 and 2000? No it’s probably closer to 1800, or maybe lower, but I don’t know where to draw the lines. The pink bar doesn’t stop at 1400, either, probably a bit lower. Impossible to tell because of the difficulties of rendering perspective and parallax onto a 2D surface. You can improve on this chart simply by removing the gratuitous 3D effects. 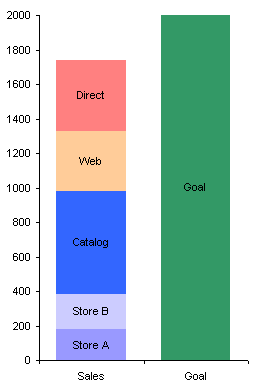 The example below shows how to use a line instead of another column to indicate a goal. The data values are placed in a single column, because only one category is needed. After creating the 2D stacked column chart, the “Goal” series is converted to an XY series (the red square), and X error bars are applied to the XY series, using positive and negative values of 0.4 (left). The marker (red square) is hidden, the error bars are formatted, and the series is given a data label “Goal”. The colors have also been fixed up, though a graphics designer would be able to develop a better color scheme (right). If desired, the Goal series could still be represented as a column, as shown below. 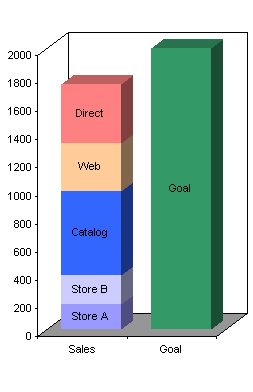 In the first chart, the Goal series is on the Primary axis, while the individual sales outlet series are on the secondary axis, so they lie in front of the goal. The gap width for the Goal series is made smaller (50) than for the other series (the default 150), and the secondary Y axis was deleted. This is pretty much what the original 3D behemoth was intended to show. 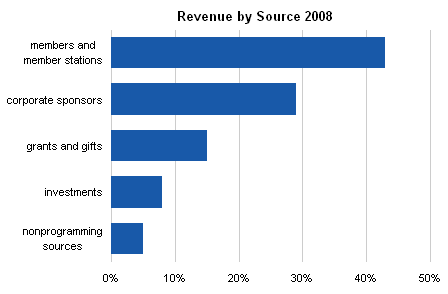 In the second chart, the sales outlet series remain on the Primary axis, while the Goal series was moved to the Secondary axis, given a border, and made transparent (no fill). The gap width for all series was set to 50, and the secondary Y axis was deleted. Let’s return to the original data and the original chart, and compare a 2D Excel chart with default formatting with the corresponding 3D chart with default formatting. 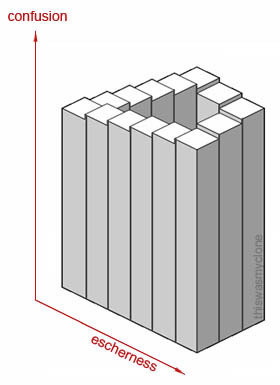 The 3D chart requires extra shapes to give the false illusion of depth. Also, to make room for the added shapes, the chart does not fill its space as completely. Let’s take this a step further, and deconstruct the 3D chart to see how many elements are critical and how many are pure junk. I copied the chart as a picture (not a bitmap), pasted it into PowerPoint twice, and ungrouped both copies. I kept all 3D junk in one chart and removed the non-junk elements, and I removed all the 3D junk from the other. There was some stretching of the fonts and some darkening of the borders, but you get the idea. The chart on the left shows all the extra stuff required to give the illusion of a third dimension. The chart on the right shows that even with the junk removed, the display is skewed upwards and to the right to allow room for the added shapes. 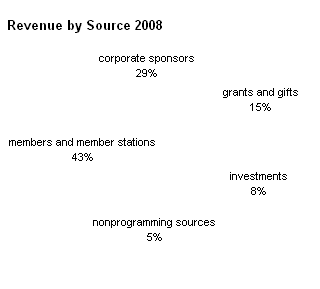 This deconstruction illustrates the amount of clutter that must be added to a chart to provide the unnecessary illusion of depth, and the skewing of data needed to accommodate the clutter. Posted: Thursday, April 10th, 2008 under Chart Types.